Technology as liberator rather than jailer; music as a moment in time, not something fixed in aspic - Caoimhín Ó Raghallaigh refuses to conform to tired notions of what a musician might or might not be. Piper, whistle-player, fiddler, physicist and philosopher, Ó Raghallaigh is fascinated by all that the iPod generation has to grapple with and all that multimedia has to offer him as a musician. Having released Kitty Lie Over, a widely admired CD with piper Mick O'Brien, in 2003, he recently put out (online only) an EP called Where the One-Eyed Man is King. The freedom to capture music in its moment and distribute it in multiple formats, ranging from individual MP3 tracks on iTunes to video clips on MySpace (or, potentially, as soundtracks to films, plays or visual art installations), is something Ó Raghallaigh embraces wholeheartedly. He's never been hugely impressed anyhow with conventional thinking on the release of a pristine album that somehow captures the zeitgeist and an artist's identity forever. "It's really liberating because it lets you do a wide range of stuff", Ó Raghallaigh enthuses. "You can do something very traditional on one EP and something completely abstract on another, whereas with an album, you have to put in so much work and it needs to have a coherence that can be very limiting. It reminds me of the start of a book that says 'he jumped on his horse and rode off madly in all directions' - an EP is ideal for that." Ó Raghallaigh's musical identity is like something refracted through a pane of shattered glass. He plays the Norwegian Hardanger fiddle with grave commitment, and he's a huge fan of Pádraig O'Keeffe and the musical accents of Sliabh Luachra; he collaborates with west Kerry box player Breanndán Begley and with Cúil Aodha sean-nós singer Iarla Ó Lionáird; he relishes the sonic explorations of contemporary composer and music technologist Donnacha Dennehy and the work of Iceland's Sigur Rós. "Obviously I love traditional music, but I do think that there isn't a cultural curiosity in the same way as there is with, for example, jazz or classical music," he says. 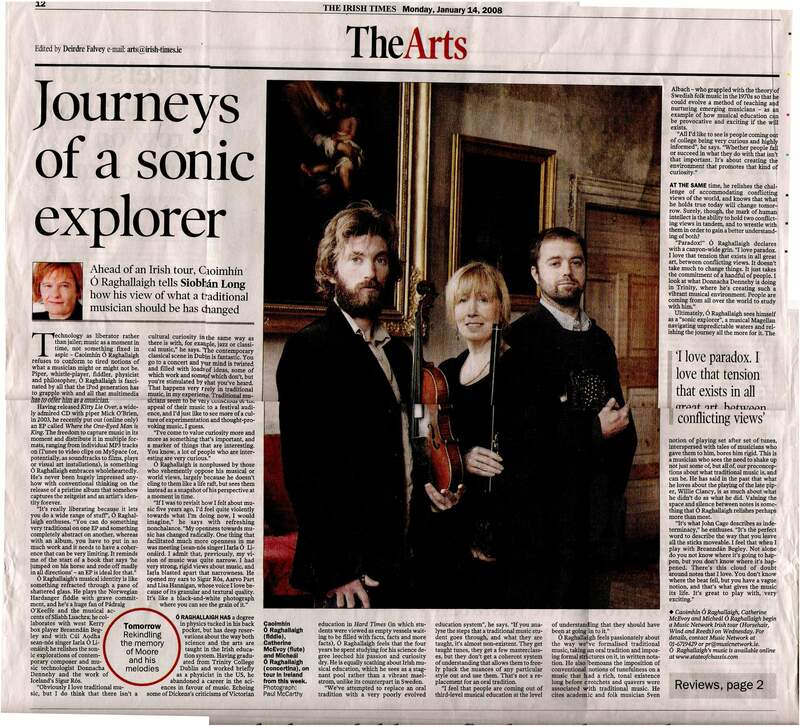 "The contemporary classical scene in Dublin is fantastic. You go to a concert and your mind is twisted and filled with loads of ideas, some of which work and some of which don't, but you're stimulated by what you've heard. That happens very rarely in traditional music, in my experience. Traditional musicians seem to be very conscious of the appeal of their music to a festival audience, and I'd just like to see more of a culture of experimentation and thought-provoking music, I guess." "I've come to value curiosity more and more as something that's important, and a marker of things that are interesting. You know, a lot of people who are interesting are very curious." Ó Raghallaigh is nonplussed by those who vehemently oppose his musical or world views, largely because he doesn't cling to them like a life raft, but sees them instead as a snapshot of his perspective at a moment in time. "If I was to revisit how I felt about music five years ago, I'd feel quite violently towards what I'm doing now, I would imagine," he says with refreshing nonchalance. "My openness towards music has changed radically. One thing that facilitated much more openness in me was meeting [sean-nós singer] Iarla Ó Lionáird. I admit that, previously, my vision of music was quite narrow. I had very strong, rigid views about music, and Iarla blasted apart that narrowness. He opened my ears to Sigur Rós, Arvo Part and Lisa Hannigan, whose voice I love because of its granular and textural quality. It's like a black-and-white photograph where you can see the grain of it." Ó RAGHALLAIGH HAS a degree in physics tucked in his back pocket, but has deep reservations about the way both science and the arts are taught in the Irish education system. Having graduated from Trinity College Dublin and worked briefly as a physicist in the US, he abandoned a career in the sciences in favour of music. Echoing some of Dickens's criticisms of Victorian education in Hard Times (in which students were viewed as empty vessels waiting to be filled with facts, facts and more facts), Ó Raghallaigh feels that the four years he spent studying for his science degree leeched his passion and curiosity dry. He is equally scathing about Irish musical education, which he sees as a stagnant pool rather than a vibrant maelstrom, unlike its counterpart in Sweden. "We've attempted to replace an oral tradition with a very poorly evolved education system", he says. "If you analyse the steps that a traditional music student goes through, and what they are taught, it's almost non-existent. They get taught tunes, they get a few masterclasses, but they don't get a coherent system of understanding that allows them to freely pluck the nuances of any particular style out and use them. That's not a replacement for an oral tradition. "I feel that people are coming out of third-level musical education at the level of understanding that they should have been at going in to it." Ó Raghallaigh feels passionately about the way we've formalised traditional music, taking an oral tradition and imposing formal strictures on it, in written notation. He also bemoans the imposition of conventional notions of tunefulness on a music that had a rich, tonal existence long before crotchets and quavers were associated with traditional music. He cites academic and folk musician Sven Ahlback - who grappled with the theory of Swedish folk music in the 1970s so that he could evolve a method of teaching and nurturing emerging musicians - as an example of how musical education can be provocative and exciting if the will exists. "All I'd like to see is people coming out of college being very curious and highly informed", he says. "Whether people fail or succeed in what they do with that isn't important. It's about creating the environment that promotes that kind of curiosity." AT THE SAME time, he relishes the challenge of accommodating conflicting views of the world, and knows that what he holds true today will change tomorrow. Surely, though, the mark of human intellect is the ability to hold two conflicting views in tandem, and to wrestle with them in order to gain a better understanding of both? "Paradox!" Ó Raghallaigh declares with a canyon-wide grin. "I love paradox. I love that tension that exists in all great art, between conflicting views. It doesn't take much to change things. It just takes the commitment of a handful of people. I look at what Donnacha Dennehy is doing in Trinity, where he's creating such a vibrant musical environment. People are coming from all over the world to study with him." Ultimately, Ó Raghallaigh sees himself as a "sonic explorer", a musical Magellan navigating unpredictable waters and relishing the journey all the more for it. The notion of playing set after set of tunes, interspersed with tales of musicians who gave them to him, bores him rigid. This is a musician who sees the need to shake up not just some of, but all of, our preconceptions about what traditional music is, and can be. He has said in the past that what he loves about the playing of the late piper, Willie Clancy, is as much about what he didn't do as what he did. Valuing the space and silence between notes is something that Ó Raghallaigh relishes perhaps more than most. "It's what John Cage describes as indeterminacy," he enthuses. "It's the perfect word to describe the way you leave all the sticks moveable. I feel that when I play with Breanndán Begley. Not alone do you not know where it's going to happen, but you don't know where it's happened. There's this cloud of doubt around notes that I love. You don't know where the beat fell, but you have a vague notion, and that's what gives the music its life. It's great to play with, very exciting."